Twenty years ago, a photographer’s work was carried out under different conditions. Both in his working life and in the material he used. His camera was analog and making a sparse use of the shots was always necessary; with just 36 snapshots per roll. Iosu Pezonaga worked under these conditions when he managed to shoot this photo of which he now speaks so proudly. The snapshot was taken from the ground level just inside the fencing, precisely at the Telefónica stretch. 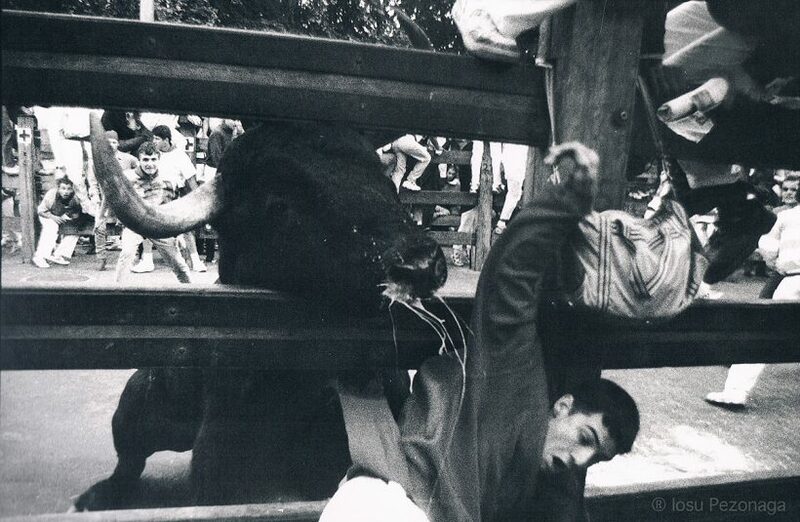 It all happened on the very last day of the 1996 Sanfermin fiestas. As Iosu himself recalls it, “The bull, from the Marqués de Domecq bull-ranch, was taking up the rear after having fallen in Estafeta Street and it arrived in an agitated state, charging at everything that moved on both sides “. In comparison with many of the very fast Runnings of the Bulls which we see so often today, this one could be considered as quite a long one at a time of 4min. 28sec” and which finished with just one runner suffering a goring. Iosu Pezonaga has no hesitation in affirming that, to get a snapshot like that, it is necessary to have accumulated “not a little experience, not a little technical skill and a lot of luck”. Capturing those kinds of moments, have tinges of unexpected heroism as it is always going to be something that is practically unforeseeable. “I had just jumped down inside the fencing and I was planning to take some photos at ground level and just then this big “Marqués de Domecq” appeared as it charged at the runner that you can see in the photo”, relates Pezonaga.